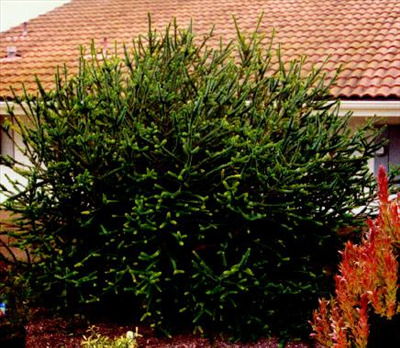 Very decorative medium shrub, with bright green small leaves and lime green flowers appearing in spring/summer. Tolerant of most well-drained soils and situations. Flowers best in coastal situations. Foliage damaged by moderate frost and heavy frost can kill plants. Excellent screen or windbreak as plants respond to pruning. Plants are usually dense to ground level. Great cut foliage and bird attracting shrub. Propagation Information: Seed germinates readily. Usually grown by cuttings.